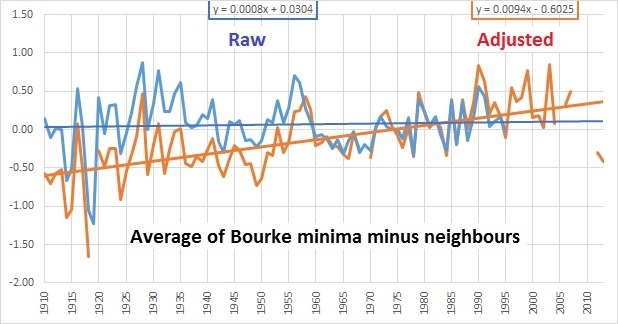 I have commenced the long and tedious task of checking the Acorn adjustments of minimum temperatures at various stations by comparing with the lists of “highly correlated” neighbouring stations that the Bureau of Meteorology has kindly but so belatedly provided. Up to 10 stations are listed for each adjustment date, and presumably are the sites used in the Percentile Matching process. 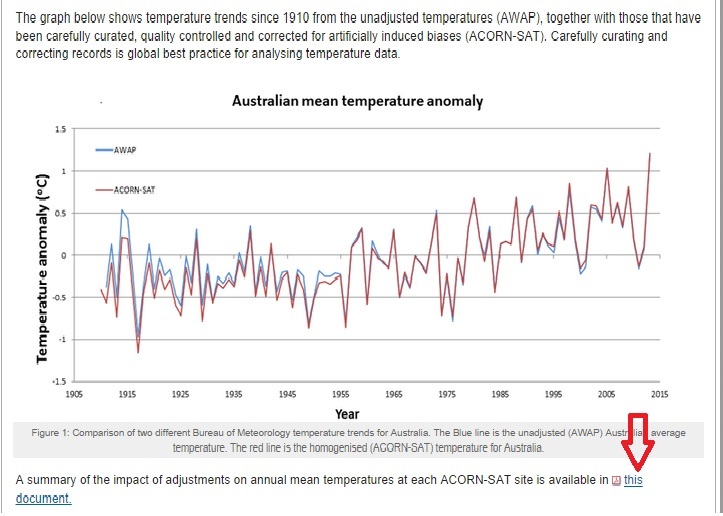 It is assumed by the Bureau that any climate shifts will show up in all stations in the same (though undefined) region. Therefore, by finding the differences between the target or candidate station’s data and its neighbours, we can test for ‘inhomogeneities’ in the candidate site’s data, as explained in CTR-049, pp. 44-47. Any inhomogeneities will show up as breakpoints when data appears to suddenly rise or fall compared with neighbours. Importantly, we can use this method to test both the raw and adjusted data. Ideally, a perfect station with perfect neighbours will show zero differences: the average of their differences will be a straight line at zero. Importantly, even if the differences fluctuate, there should be zero trend. Any trend indicates past temperatures appear to be either relatively too warm or too cool at the station being studied. It is not my purpose here to evaluate whether or not individual adjustments are justified, but to check whether the adjusted Acorn dataset compares with neighbours more closely. If so, the trend in differences should be close to zero. In all cases I used differences in annual minima anomalies from the 1961-1990 mean, or if the overlap was shorter than this period, anomalies from the actual period of overlap. Where I am unable to calculate differences for an Acorn merge or recent adjustment due to absence of suitable overlapping data (e.g. 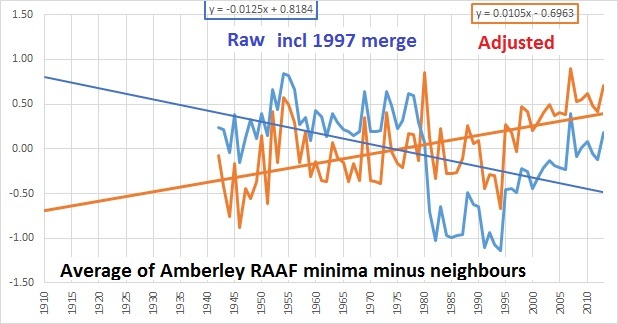 Amberley 1997 and Bourke 1999, 1994), as a further test I have assumed these adjustments are correct and applied them to the raw data. I have completed analyses for Rutherglen, Amberley, Bourke, Deniliquin, and Williamtown. 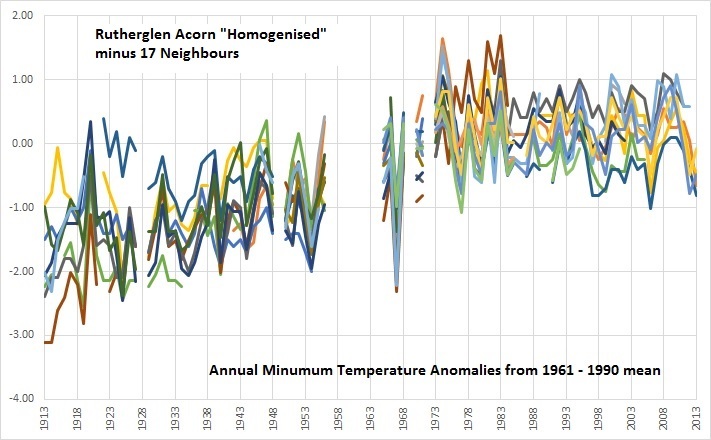 In every case, the average difference between the Acorn adjusted data and the neighbouring comparison stations shows a strongly positive trend, indicating Acorn does not accurately reflect regional climate. Even when later adjustments are assumed to be correct the same effect is seen. 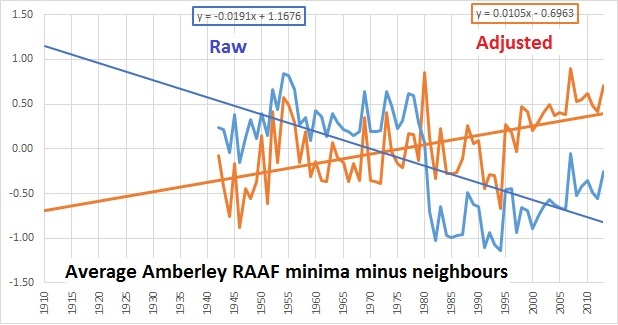 Based on differencing Raw and Adjusted data from listed comparison stations at five of the sites that have been discussed by Jennifer Marohasy, Jo Nova, or myself recently, Acorn adjustments to minima have a distinct warming bias. It remains to be seen whether this is a widespread phenomenon. I will continue analysing using this method for other Acorn sites, including those that are strongly cooled. At those sites I expect to find the opposite: that the differences show a negative trend. Scroll down for graphs showing the results. Treating the 1997 adjustment as correct has no effect on the trend in differences. 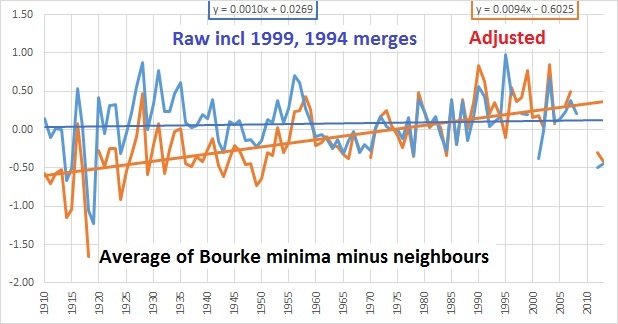 Bourke (b): 1999 and 1994 merges assumed correct. No change in trend of differences. On Monday, quietly and without any announcement, a new tab appeared on the Bureau’s ACORN-SAT webpage. Finally it will be possible to check the methods and results using the correct comparison stations- until now we could only guess. That was two and a half years ago. What took so long? Why was it not publicly available from the start? 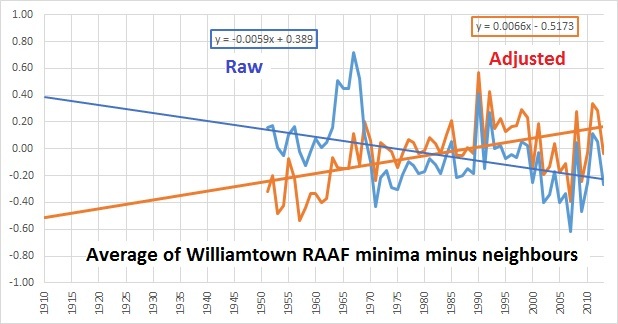 Perhaps it is just a co-incidence that the long awaited information was released shortly after a series of articles by Graham Lloyd appeared in The Australian, pointing out some of the apparent discrepancies between raw and adjusted data. Graham Lloyd deserves our heartfelt thanks. The Bureau of Meteorology has been dragged kicking and screaming into the 21st Century. The Bureau is having trouble coming to terms with this new era of transparency and accountability, an era in which decisions are held up to public scrutiny and need to be defensible. “E6. The Review Panel recommends that the Bureau assembles and maintains for publication a thorough list of initiatives it has taken to improve transparency, public accessibility and comprehensibility of the ACORN-SAT data-set. 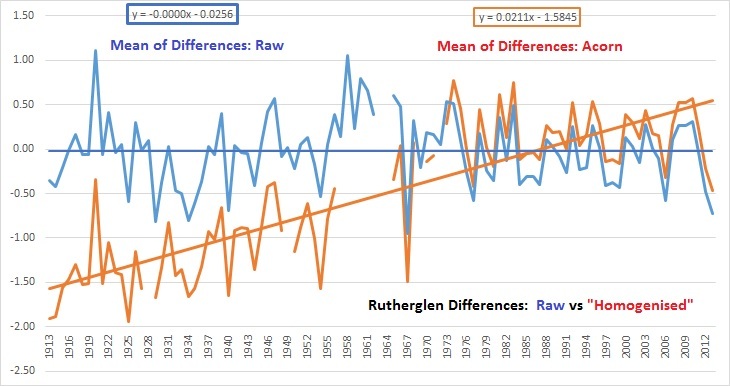 This follows on from my last post where I showed a quick comparison of Rutherglen raw data and adjusted data, from 1951 to 1980, with the 17 stations listed by the Bureau as the ones they used for comparison when detecting discontinuities. Here is an alternate and relatively painless way to check the validity of the Bureau’s homogenisation methods at Rutherglen, based on their own discontinuity checks. According to the “Manual” (CAWCR Technical Report No. 49), they performed pair-wise comparisons with each of the 17 neighbours to detect discontinuities. An abbreviated version of this can be used for before and after comparisons. 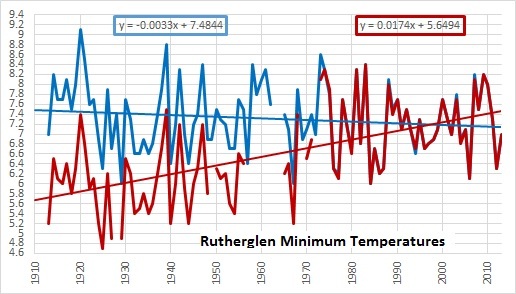 For each of the 17 stations, I calculated annual anomalies from the 1961-1990 means for both Rutherglen and the comparison site, then subtracted the comparison data from Rutherglen’s. I did the same with Rutherglen’s adjusted Acorn data. A discontinuity is indicated by a sudden jump or drop in the output. 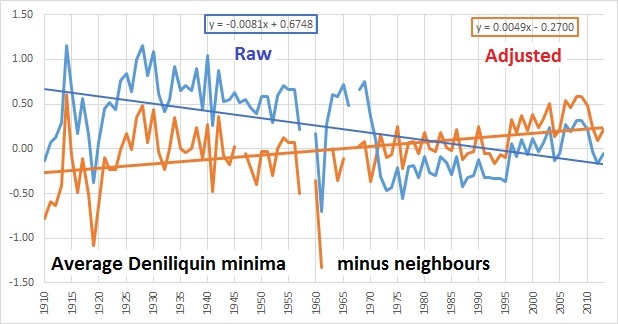 The ideal, if all sites were measuring accurately and there are no discontinuities, would be a steady line at zero: a zero value indicates temperatures are rising or falling at the same rate as neighbours. In practice no two sites will ever have the same responses to weather and climate events, however, timing and sign should be the same. Therefore pairwise differencing will indicate whether and when discontinuities should be investigated for possible adjustment. Similarly, pairwise differencing is a valid test of the success of the homogenisation process. Successful homogenisation will result in differences closer to zero, with zero trend in the differences over time. The Bureau has told the media that adjustments are justified by discontinuities in 1966 and 1974. Let’s see. Note: there is a discernible drop in 1974, to 1977. 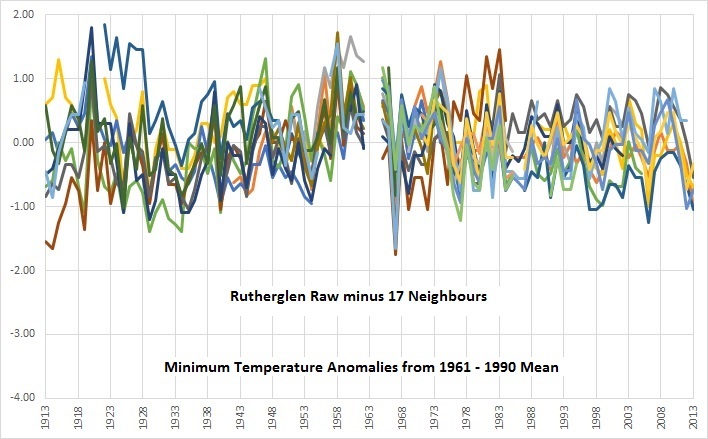 There is a very pronounced downwards spike in 1967 (ALL differences below zero, indicating Rutherglen data were definitely too low.) There also a step up in the 1950s, and another spike upwards in 1920. 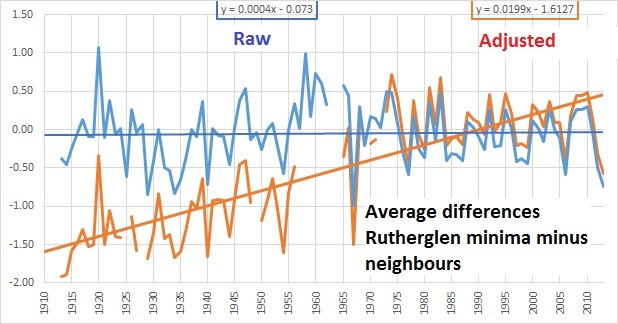 Rutherglen is also lower than most neighbours in the early 1930s. Also note several difference lines are obviously much higher or lower than the others, needing further investigation, but the great majority cluster together. Their differences from Rutherglen are fairly consistent, in the range +/- 1 degree Celsius. The contrast is obvious. The 1920 and 1967 spikes remain. Differences from adjusted data are NOT closer to zero, most of the differences before 1958 are now between 0 and -2 degrees Celsius, and there is now an apparent large and artificial discontinuity in the late 1950s. This would indicate the need for Rutherglen Acorn data to be homogenised! There is now a large positive trend in the differences when the trend should be close to zero. (A) The Bureau used a different set of comparison stations. If so, the Bureau released false and misleading information. (B) As this surely can’t be true, then if these 17 stations were the ones used, this is direct and clear evidence that the Bureau’s Percentile Matching algorithm for making homogenisation adjustments did not produce correct, successful, or useful results, and further, that no meaningful quality assurance occurred. If homogenising did not work for Rutherglen minima, it may not have worked at the other 111 stations. While I am sure to be accused of “cherry picking”, this analysis is of 100% of the sites for which the identities of comparison stations have been released. When the Bureau releases the lists of comparison stations for the other 111 sites we can continue the process. A complete audit of the whole network is urgently needed. You are currently browsing the kenskingdom blog archives for September, 2014.